I love broccoli. I always have. I especially like the stems. Small heads of broccoli were on sale at my supermarket this past weekend. Ususally I steam them but I decided to roast it this time-so easy and super delicious. I love that the little parts on the top get a bit singed and crunchy. Honestly this couldn’t be any easier. Preheat oven to 400. Line a cookie sheet with foil. 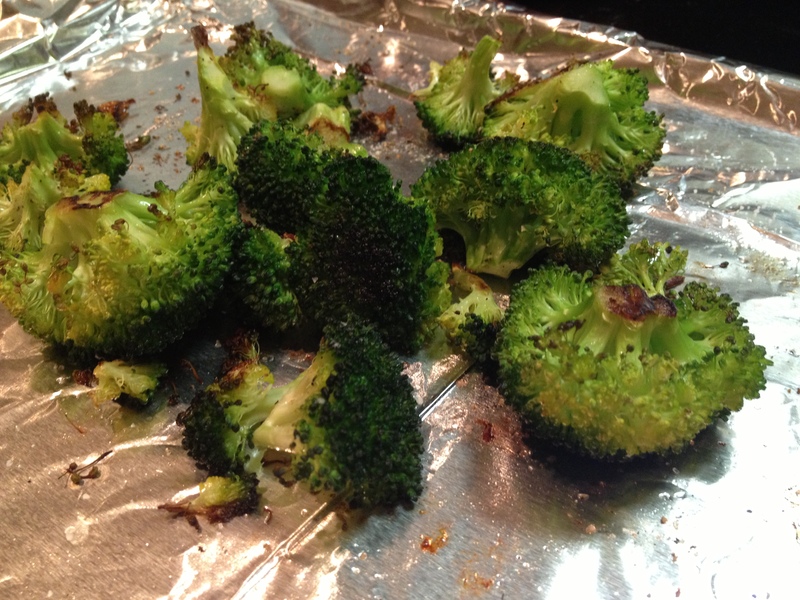 Lay broccoli on cookie sheet and drizzle with olive oil. Give the broccoli a few swishes around to cover them lightly with oil. 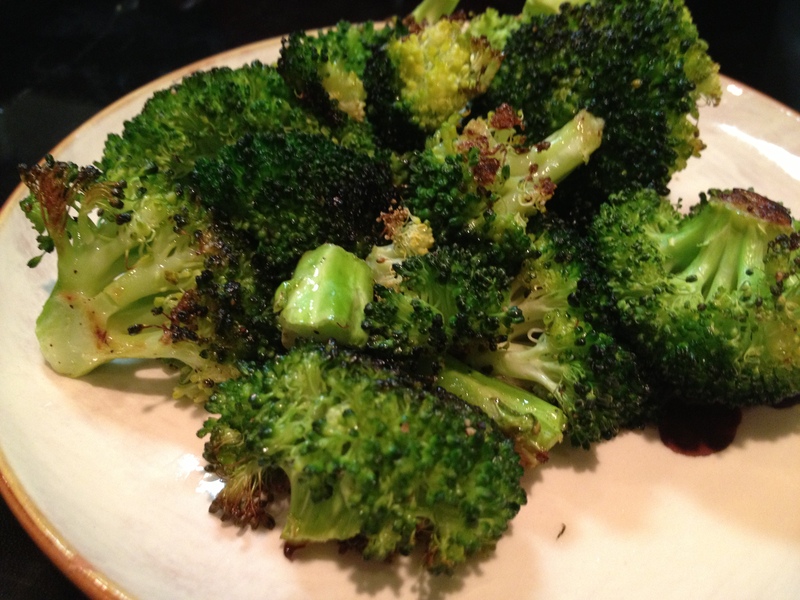 Sprinkle the broccoli with salt and pepper and put them in the oven for about 15-20 minutes. Watch it carefully-they burn easily. Remove when they reach the desired done-ness. Freshly grated parmesan cheese would also be spectacular sprinkled on these after they’re done cooking. I love when I receive my new issue of Cooking Light Magazine in the mail. There are always a ton of great recipies and most of them can be put together really quickly. The recipe that I adapted the recipe below is from the October, 2012 issue. I added and removed a few items from the original recipe and it turned out great. It took all of 25 minutes start to finish, including prep. While rice is cooking combine soy sauce, hoisin sauce and cornstarch and whisk to combine. Add beef and toss to coat. Heat a large skillet over high heat and add oil to pan, swirling to coat. Place the beef in the skillet but use your fingers and shake off excess marinade into the bowl. Reserve that marinade. Cook the beef for 2 minutes or until browned, stirring occasionally. Remove the beef from pan and set aside. Add the broccoli and cook until thawed but not cooked through, then add the next 4 ingredinets through sesame oil to pan and cook until broccoli and peas are crisp-tender. Add the reserved marinade and bring to a boil. Cook 1 minute. Add beef to the pan, cook 1 minute until thoroughly heated. 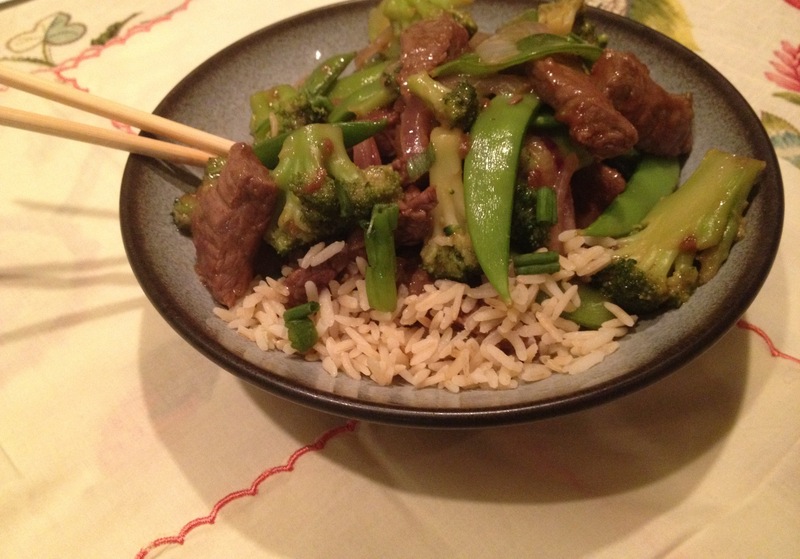 Serve stir-fry over rice and garnish with green onions.